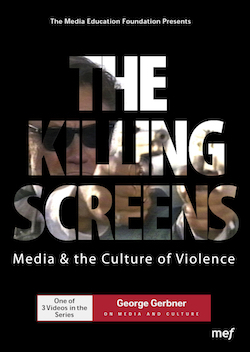 Addressing specifically the question of violence and the media, The Killing Screens urges us to think about the effects of the media in new and complex ways. In contrast to the relatively simplistic behaviorist model that media violence causes real-world violence, Gerbner encourages us to think about the psychological, political, social and developmental impacts of growing up and living within a cultural environment of pervasive, ritualized violent images. "What lives in a box and commits six to eight acts of mayhem and murder per hour, witnessed by millions of people worldwide an average of six to seven hours a day? You know the answer, of course. George Gerbner, dean emeritus of the Annenberg School of Communication, offers an insightful deconstruction of TV violence and its consequences, punctuated by a montage of prime time's "expertly choreographed brutality." Gerber ends his talk with a discussion of what is needed to foster responsible citizenship in the new, perilous media environment."